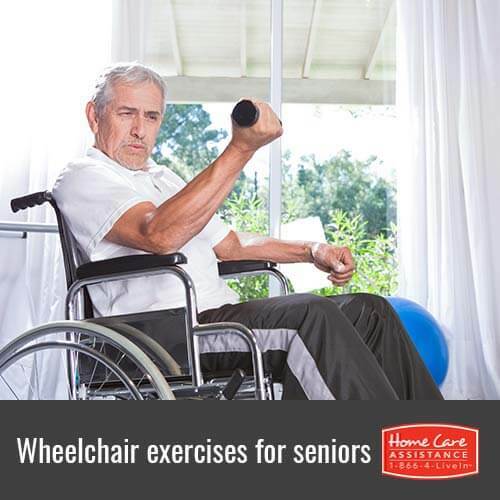 Seniors with limited mobility can still perform many basic exercises from a wheelchair, and Home Care Assistance of Rhode Island hopes family caregivers will share these modified moves with their senior loved ones. The following exercises can tone and strengthen the muscles of the arms, upper body, abdominal area and legs. With good posture, place a soft ball between the knees. Squeeze the ball by contracting the inner thigh muscles and release slightly, but not all the way, and repeat as many times as needed. Sit tall and place paper plates under each foot. Push onto the right plate and slide the foot forward. Slide the foot back, pressing onto the plate while sliding the left foot forward. This engages and strengthens the hamstring muscles. Continue with alternating sides. Sit and hold light to medium dumbbells or soup cans. Curl the weight up toward the shoulder and release. Try not to swing the weights. Be conscious of engaging the abs while curling the weights. Sit tall while holding dumbbells in both hands. Begin the move with arms bent to 90 degrees, with weights next to the ears. The arms will resemble a goal post. Press the weights overhead, lower them back down and repeat. Sit straight up while holding a dumbbell in front of the chest. Contract the abs while rotating the torso to the right as the hips and legs remain facing forward. Contract the abs to bring the weight back to center and then rotate to the left. Repeat. An active senior is a happy senior, and your loved one can still maintain a healthy fitness routine with the modified exercises above. With additional help from Home Care Assistance, your elderly family member will receive the support he or she needs to promote health and longevity. Call us today at 401.284.0979 and ask about our live-in or part-time care in Rhode Island. Our trained caregivers can offer your loved one individualized assistance with nutritious meal planning and modified exercise, as well as offer companionship and transportation to events or appointments. Don’t hesitate to call and request your free in-home consultation today.